You are here: Home / News / Latest News & Offers / Top 5 Easter Crafts! Spring is here and that means Easter is just around the corner! This is the perfect time of year for getting crafty and creative so we have put our heads together to come up with 5 brilliant craft ideas that will really put a ‘spring’ in your step…sorry we couldn’t resist that one! Following on from the successful launch of our Woodland Buddies Sew & Collect kits, we are happy to announce that we have created three brand new Easter themed sewing kits! 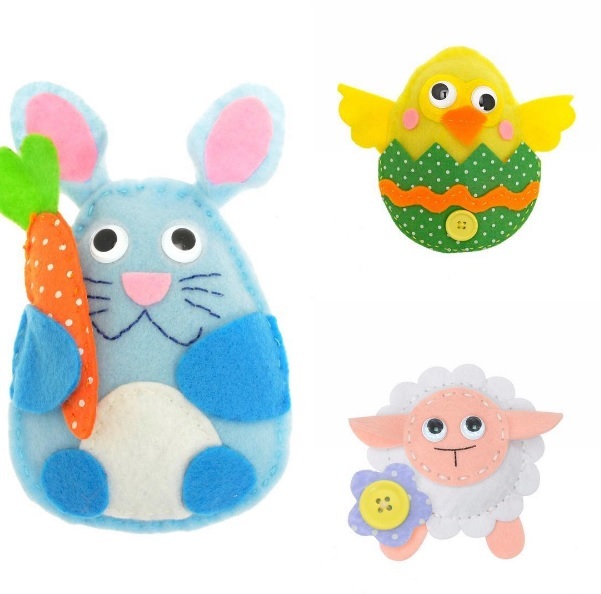 The adorable range – made up of Bertie the Bunny, Charlie the Chick and Lyla the Lamb – are all simple to sew with pre-punched holes and a safety needle and they are ideal for improving concentration and hand/eye co-ordination. A brilliant alternative to Easter eggs! 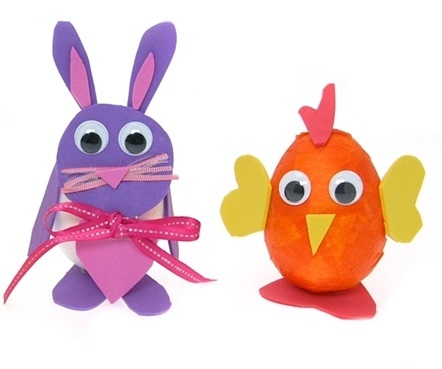 Another great alternative to chocolate is our Easter Egg Decorating Kit! 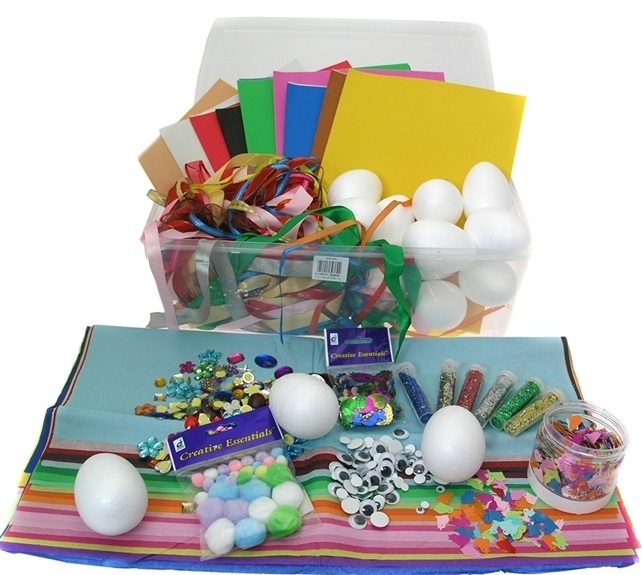 An ideal project for children to do during the Easter holidays, each kit contains enough contents to decorate 20 x 80mm polystyrene eggs that will add the finishing touch to any Easter display! Full contents include 20 x 80mm polystyrene eggs, glitter, tissue paper, ribbon, self-adhesive jewels, sequins, foam sheets and pastel pom poms. Instead of buying Easter cards this year, why not add a more personal touch and make your own? Our brilliant Card Blanks Classpack is made up of 100 x C6 card blanks so you’ll be spoilt for choice when it comes to creating the perfect card. 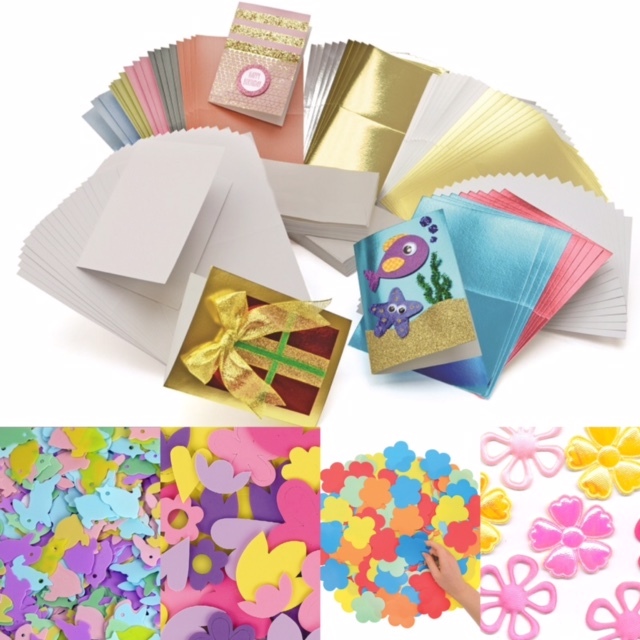 Why not adding the finishing touch with some of our fantastic craft accessories such as our decorative flower shapes – available in foam, satin or paper – or Easter sequins? As well as being an essential part of our Egg Decorating Kits, our polystyrene eggs also make brilliant models for Easter displays! Available in either 70 or 80mm, these eggs are the perfect shape for you to make cute little Easter chicks or bunnies! The only other things you’ll need are tissue paper, foam, wiggly eyes and your imagination! Although this technically isn’t a craft idea, we have a brilliant range of themed classroom display materials that would be ideal for teachers trying to brighten up boring displays! Our Fadeless Spring Display pack contains four rolls of paper and twelve Bordette decorative border rolls that will make the perfect themed display. 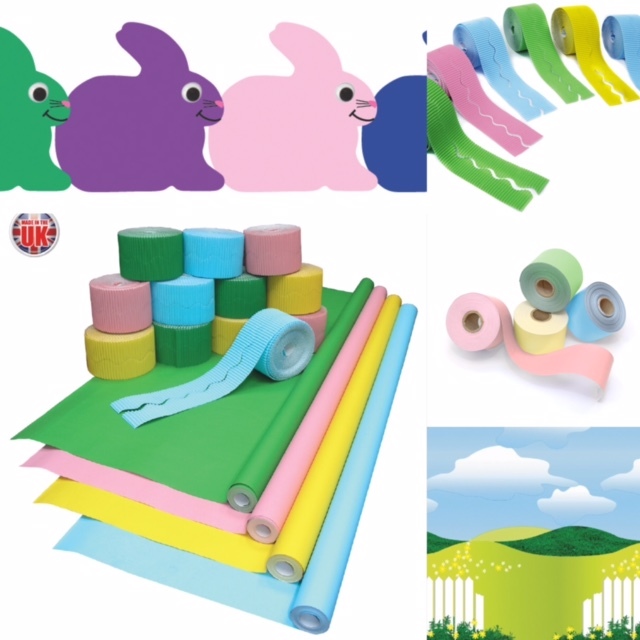 Our Spring Bordette assortments and Pastel border rolls also offer the perfect finishing touch to displays, while our Bunnies die cut trimmers are ideal if you really want to make your display stand out from the rest! Or, if you’re trying to create a Spring countryside display then look no further than our Fadeless Design Landscape display paper. Available in either 1218mm x 3.6m or 15m sizes, this paper sets the scene perfectly so all you need to do is add the final decorations! All of the items mentioned here are available to buy now on our website or through our catalogue. Visit http://www.creativitycrafts.co.uk to order online, or contact us on 01384 485550 to request a catalogue. http://www.cilimited.co.uk/wp-content/uploads/easter-banner.jpg 516 912 fusiondev http://www.cilimited.co.uk/wp-content/uploads/header-logo-3.png fusiondev2017-03-31 17:49:542017-10-19 18:03:29Top 5 Easter Crafts! Gift Ideas for Mother’s Day! CBeebies Range Officially Launched!